Sometimes finding your way home takes more than courage. It takes a leap of faith. 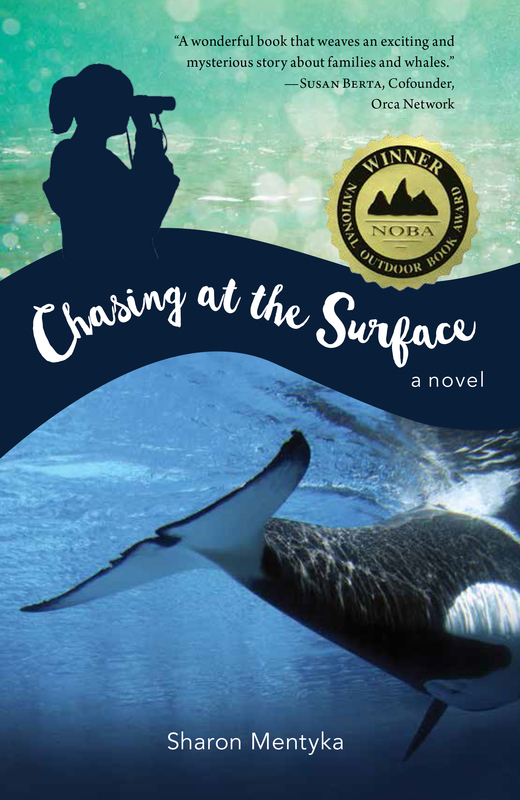 Inspired by an actual event, CHASING AT THE SURFACE is the story of a young girl’s courage and the healing power of nature. After her mother unexpectedly leaves home, 12-year old Marisa struggles with her feelings of loss and abandonment just as a pod of nineteen orca whales—mothers with their new calves following a run of chum salmon—become entrapped in the enclosed inlet near her Northwest home. Can Marisa find a way to free the whales even if it means facing the secrets in her mother’s past? Her journey brings her to a new understanding of courage, the assaults humans have had on nature, and the complicated meaning of home and family. If you place an order through my local bookstores, University Bookstore, Seattle or Phinney Books, I can sign your copy for you! Just add a note and request it be signed by author Sharon Mentyka when you place your order. Or find it at your local independent bookstore.